I’ve read bits and pieces of their works last year and boy, did I love them. I only remembered to properly read their works now after seeing Renai Rubi on sale in Rakuten last Christmas. I decided to buy Sabita as well, seeing as Renai is a spin-off of Sabita. Since I’m obsessing over Ogeretsu Tanaka lately, prepare for an onslaught of Ogeretsu-related posts in the following weeks (with a couple of posts from other books I guess). In Sabita Yoru Demo Koi wa Sasayaku (gosh that’s a mouthful), Yumi is in an abusive relationship with his boyfriend Kan-chan. Despite his cute name, Kan-chan hits Yumi every time even while doing it, treating his boyfriend’s body as his personal punching bag. All this time, Yumi consents this, not questioning things and accepts whatever comes his way. For him, Kan-chan can do anything to him and he won’t resist. This is why I was pretty sure I’d hate this at first. Violence isn’t really my thing and abusive relationships are a no-no. Then, enter Mayama, Yumi’s friend from way back middle school. When they meet again, Yumi gets knocked out of his orbit. 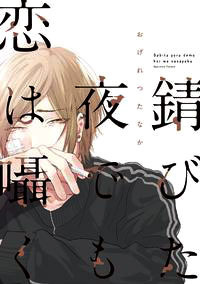 Mayama is the past he’d never wanted to remember yet the guy is persistent when it comes to connecting with Yumi again. Yumi tries to keep a distance but always finds a reason to meet Mayama instead. All the while continuing to receive the punches his boyfriend gives. I find myself so caught up in Yumi’s mess of emotions. He tries so hard to deny everything and ends up running away. But while Yumi is pretty relatable, I find Mayama extremely endearing. He is pure and honest in every sense of the word. He has the built of an alpha-seme but has the attitude of the cutest uke. Despite his timid nature, he never beats around the bush and tells Yumi what his friend needs to hear, no matter how harsh that might come across. Then there’s Kan-chan. I think, most of us hates this guy at first. This violent and grumpy boyfriend who hits his lover without any good reason is detestable. Which makes me wonder what the hell happened to this guy. Back in their high school days, he is the first one to approach Yumi and is friendly to their classmates. The pictures tell nothing about his change of behavior but gives us a glimpse of how well their relationship was before. What appeals to me the most is how everyone mans up. Yumi, Mayama, and even Kan-chan acknowledges their mistakes and do their best to correct it and move on. Though it would have been a wee bit better if Yumi and Kan-chan talk or at least for that scene be a bit longer. After all, they have a history that can never be erased (heck, some are engraved in Yumi’s body even). They can’t just stand up and walk away like that. But even if that scene serves as a tiny ray of happy ending light, it breaks my heart nonetheless. This manga hits all the right buttons for me. It can be light-hearted and more on the comical side at times but you’ll realize that it’s a way for the characters to cover their inner turmoil. Beneath that is a well of angst and forgotten feelings. I love how spot on this manga can be.